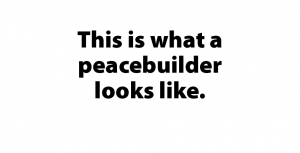 Who is a peacebuilder? You might be surprised. Peacebuilders can be found around the world, in your workplace and in your family. Peacebuilders can be found in every country, all faiths and each generation. Peacebuilders are stay-at-home parents and retirees, lawyers, teachers, farmers and activists. Peacebuilders, through acts big and small, work to transform conflict, promote justice and bring peace within their own context. As you work to cultivate compassion, fairness, equality, honesty, well-being and peace, you too, are a peacebuilder. If you've been following us on social media or at our events, you've had a chance to see some of the many faces and stories of peacebuilders in our network and you are invited to join us. Download and print out one of the signs below (or make your own), post it on your social media account and tag us. You are a peacebuilder!